The state is buying the rights to 9,000 acres of Kealakekua Heritage Ranch land on the Big Island, to permanently protect the area from development and renew the native forest. 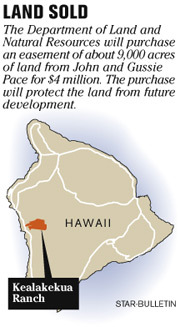 The state is buying the development rights for 9,000 acres of Big Island ranch and forest land for $4 million to protect the land from future development, the Department of Land and Natural Resources announced yesterday. 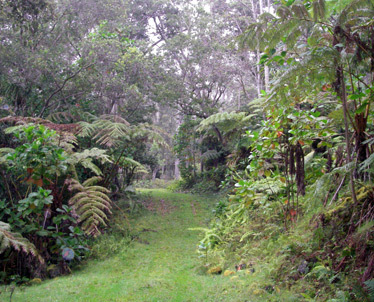 The 9-mile parcel is about 20 miles south of Kailua-Kona on Kealakekua Heritage Ranch. The Pace family, which operates a forestry and ranching business, will continue to own the land. "This is such a beautiful place," Gussie Pace said. "You don't want to mess it up with a bunch of houses." Under the deal, the Pace family will sell development rights at an 87 percent discount off the $30 million estimated value. Gussie Pace, 87, and her husband, 90-year-old John Pace, were at a news conference yesterday announcing the deal. The couple moved from Florida to Hawaii about 25 years ago and has connections with Pace, Fla., and Pace Center at Princeton University. "This way, you will use the land to the best advantage ... for people to enjoy the silence and to learn things. I want them to learn how to use the plants and how to identify the birds," Gussie Pace said. The state received $2 million from the U.S. Department of Agriculture Forest Legacy Program to purchase rights for 4,000 acres of the land and expects to receive another $2 million next year for the final 5,000 acres. Under the agreement, the Pace family or whoever else owns the land will never be able to subdivide it or build houses on it. The Pace family sold the development rights despite a county-approved plan for 500 houses and an Arnold Palmer golf course on the land before the family purchased it in 2004. George Bedone, ranch manager, said the family could have made $215 million from development but opted instead to conserve the land. The family also entered into the state's Forest Stewardship Program, a 30-year contract that outlines management plans for the land to restore the native ohia and koa forest that has been depleted after 200 years of timber extraction. The family agreed on a purchase price of $4 million, which will cover transaction fees and $3.25 million for its part in the Stewardship Program, said ranch administrator Greg Hendrickson. "We've created a massive area where it's large enough to retain that ecosystem ... to recharge our aquifers and to keep that open space and beauty which we all love and cherish," said DLNR Director Laura Thielen. "This will be forever." John Henshaw, a manager with the Forest Legacy Program, said the success of the Pace family's deal could lead to more ranchers under development pressures to conserve their land, also. "The idea of this concept working is key to the future of Hawaii," Henshaw said.